The author began playing guitar quite late at the age of 18 in 1991. Little did he know at the time that the instrument would shape his whole life from that point. He graduated with a Master of Science degree from the ICAM, "Grande Ecole" of engineering and management, in Lille, France. During the 5 years he spent there, his time was divided between playing guitar and studying. He grew a strong interest in music, musical equipment and performing. The author played his first gig just 6 month after touching his first guitar: the result was an average performance but some great memories. He also started building effects an repairing amplifiers to get the most out of his then megre budget. With his diploma in hand, he started writing for the French Guitar&Bass magazine while looking for a "proper" job. He produced equipment reviews and general articles with passion and great pleasure for this now defunct magazine. You can see some of his work here (in French only...). 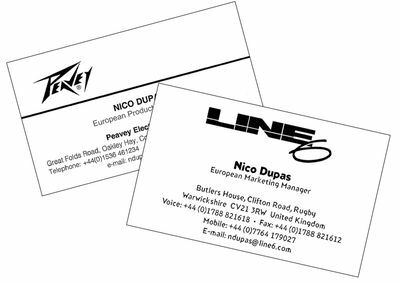 The music industry being what it is in France, the author started searching for a job in the UK and was taken on by Peavey Electronics as the French and Spanish after-sales service coordinator in Corby. He stayed more than 4 years with the company, becoming the european product manager and finally Peavey's marketing manager for Europe. This was a great experience, teaching him a lot about sales, guitars, amplifiers and PA equipment. He left in 2001 to become Line 6's European Marketing Manager until the end of 2002, gaining even more experience, launching great products such as the POD XT and the Vetta amp, and participating to the development of ground breaking gear such as the Tonecore pedals, the POD X3 or the Variax guitar. Being a strategic marketing guy amongst other things allowed him to meet many influential people for gearheads like me: Bill Clinton (designer of the Peavey 5150), Steve Grindrod (creator of the Vox AC30TBX and many classic Marshall designs), Cliff Cooper (Orange), Mark Gooday (Trace Elliott and Ashdown), Paul Day, Eddie Kramer (the GREAT producer) or Jeorge Tripps (from the legendary Way Huge Effects). He is back in France since 2003 and has obtained a Master's Degree in International Marketing and Innovation (IAE Lille). He worked for 7 years in the metallurgy industry as Marketing and Communication Manager (Pechiney-Rio-Tinto-Alcan group) and is now a consultant in international marketing and innovation management, while leading his company ToneSilk. Collecting valve amplifiers and effect pedals is one of his favorite past-time when not playing guitar with his band Poncharello. He also builds amplifiers and effects, and repairs and customises various equipment for local bands and studios (Tang, Brisa Roché, Lena Deluxe, Toxic Waste, Ed Wood Jr, Château Brutal, Didier Super, Red Studio, Gimmick studio, Lock Groove studio, etc...). Send an email if you have any questions!